I’m happy to say that a week ago, my colleague Tim Coughlan flicked the switch, to publish the code for our-journey as an open-source project. It allows a student to describe their journey through education, in terms of the highs and lows, happiness, frustrations, stress and so on. The student can chart not only the learning-related steps — writing essays, revising, group tutorials etc., but also administrative steps like applying to university, and completing a Disabled Students’ Allowance (DSA) assessment, for example. This can assist the student, tutors and support staff to work out where a problem might be, and how to intervene to ensure success. It has a firm research-based foundation. The paper-based game has been turned into an online activity, by Tim (with help from me). We’ve worked to make the code straightforward to understand, and maintainable. Also to make it portable. 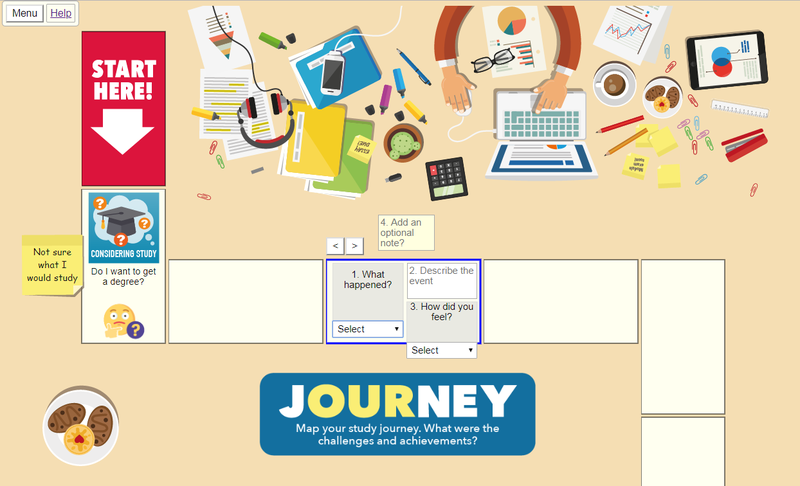 We’ve also started providing options for students to share their journeys. There is a lot still to do, and we’d love your feedback and contributions. Fork the GPL-licensed code on GitHub. 14 & 24 October 2018: Added <iframe> embed, (uses ?zoom=65 URL parameter added in v1.4.0). Version 1.4.0 contains many enhancements & fixes. Note, colleagues have undertaken accessibility testing, and Tim (and to some extent myself) are fixing issues.